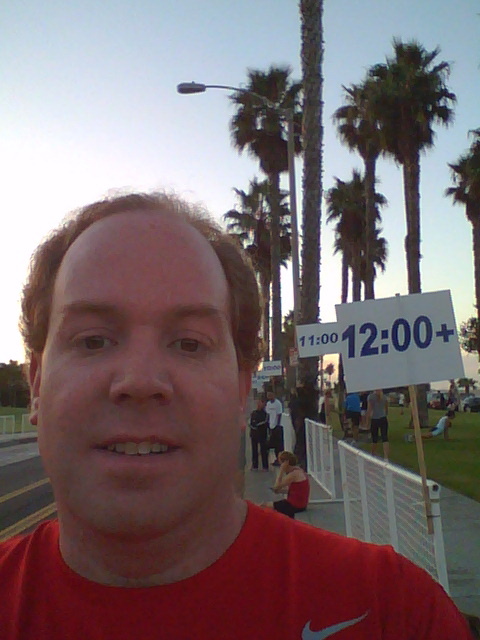 On October 7, 2012, I woke up at an ungodly hour before the sun to drive down to Santa Monica and attempt my first 10K. After working hard training in August and September, I felt ready to tackle 6.2 miles for the first time in a running event. In my training for this race, I thought that a time of 1 hour 16 minutes is what I should shoot for. I arrived in Santa Monica around an hour before the start time. Being so close to the ocean totally perked me up. Plus, there was the excitement of being around so many runners! I hate waking up so early for these events. However, once I arrive, the energy of everyone helps to bring my energy up. After all, this is what the training runs were building towards! For this race, the 5Kers would start before the 10Kers. 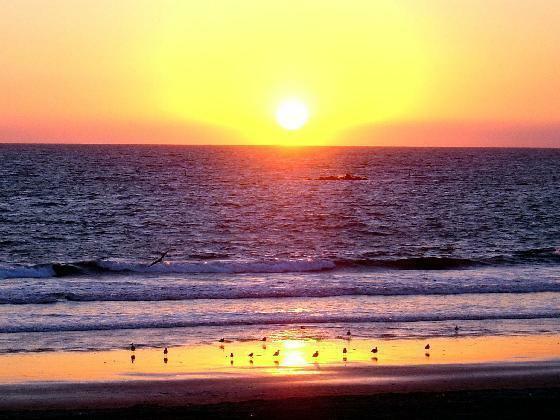 So, I waited patiently, walking around and taking pics of the beach as I waited for the 5K to start. It is fun to people watch at the running events. Unlike the runDisney events, there wasn’t anyone dressed up in fun costumes here. Just people wearing different kinds of running gear. I love seeing the families that run these events together! Hmmm. Maybe in the future, when I have kids of my own, we could do the same. There was a slight delay in starting the 5K. Once the delay was over, they had some local person sing the National Anthem. Then, the MC got the 5Kers ready and shot off the start gun. 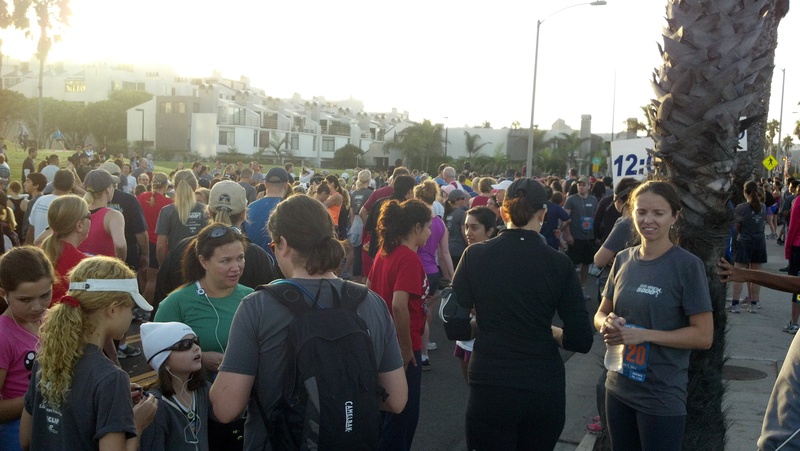 Once the 5Kers were off and out of the way, it was time to line up in our corrals. Here I am with my corral sign behind me. While waiting for my race to start, I met a lady who had run in the Boston Marathon when she was younger. Now, as an older person, she won’t do anything above a half marathon. Who could blame her? I really enjoyed her stories of the many races she had run with her husband. My next 10K was at Universal Studios. Since she had finished that 10K the year before, she gave me some advice about how to approach that one. We waited and waited for this race to start. The delay was over 15 minutes. Many of the runners started openly complaining. After all, it was going to be a pretty warm day. So, the sooner we started, the less time we would have to run in warm temps. Eventually, we did start. In the first mile, I worked to get into my run to walk ratio and pace. For me, it’s hard to restrain myself because of the excitement that comes from running with so many people. The first mile went by quicker that I had planned, finishing in 11 minues, 17 seconds. The second mile went closer to my target pace at 12 minutes, 44 seconds. It wasn’t until half way through the third mile that we’d come back to the beach. 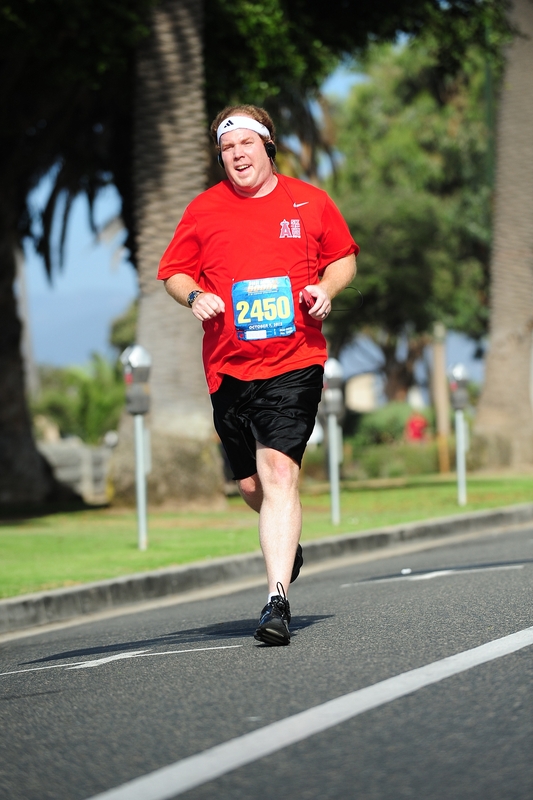 I loved running down Colorado Avenue on the way towards the Santa Monica Pier. It was breathtaking. Running along the beach was my reason for choosing this race and the view didn’t disappoint. The third mile was slower than I wanted. I may have been a little too caught up in the scenery. I finished the third mile in 13 minutes, 11 seconds. At the mile 3 marker, we came to the first water station. Due to the warm temps, I was so glad to get some water. The next mile featured a climb up to the mile 4 marker. Sad to say, the forth mile killed my hopes of making the time I wanted to begin with. I found the climb to be more taxing on me that I was ready for and I had to walk most of the way. Because this was so taxing on me physically, I also had to deal with thoughts of whether or not I would finish. The one thing that kept me going was knowing what came after the mile 4 marker. From there, the course turned around and it was down hill until the 5th mile marker. If I kept going, I knew I’d make up some time in mile 5. It took me 14 minutes, 12 seconds to complete the 4th mile. 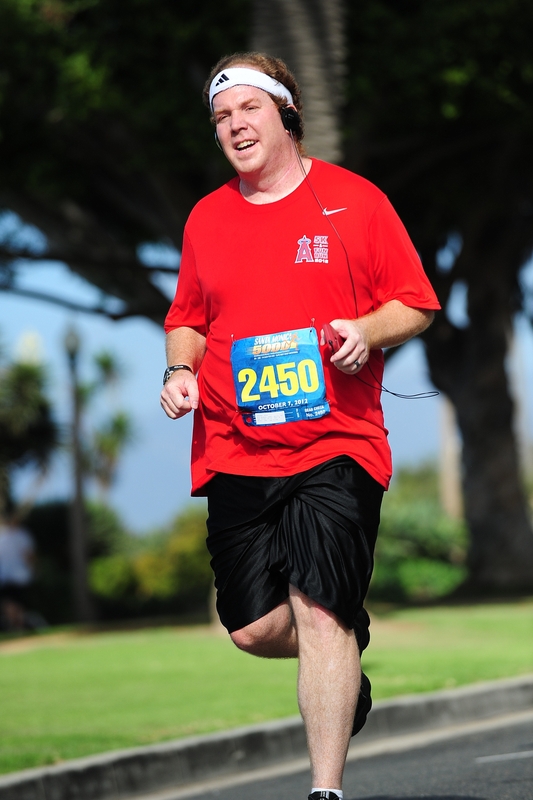 Passing the 4th mile marker was pure relief. I planned on ditching my run to walk strategy on the 5th mile because I had to make up time. Half way down, a runner was being attended to by medical personel. It reminded me of what the heat can do and freaked me out. So, I decided to go back to the run/walk strategy for the rest of the mile. I made up a little time on that fifth mile. However, not enough to get me to my goal. Mile 5 took 12 minutes, 6 seconds. When you see the photo people, it does inspire you to at least look like you’re doing well. So, I ran a little faster and longer than I would have otherwise. Once I got past him, though, the tiredness took over. In spite of the tiredness, I finished the 6th mile in 12 minutes, 9 seconds. Seeing the mile 6 marker made me very happy. I was going to finish what I started! 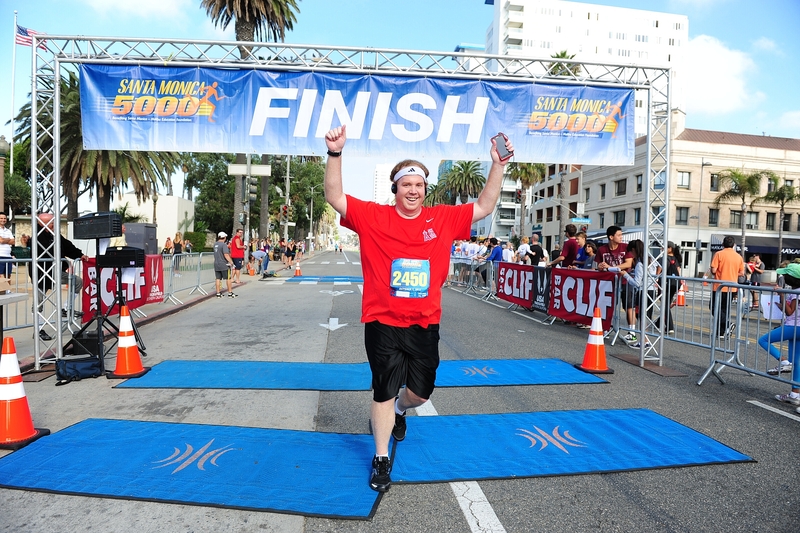 What is it about the finish line that gives you a huge burst of energy? My total time to finish was 1 hour, 18 minutes, 11 seconds. So, I didn’t miss my goal by much. However, it was still a little disappointing to miss the mark. Oh well. Maybe in the next 10K I will do better. I loved the course overall. Running by the beach was super fun! I wish the race had started on time because it was a pretty warm day (even at that time in the moring). The downside to this race was that there was no finisher medal (after all, it was my first 10K), water and post race recovery food at the finish line. As it turned out, we had to walk to the pier for the post race celebration to get any food. What I disliked about this was that, even at that celebration, they only had child sized cups to fill up with water. Argh. Next time, I’ll have to remember to bring some money to get water bottles out of the vending machines on the Santa Monica Pier. As a race, I would grade this event with a B.